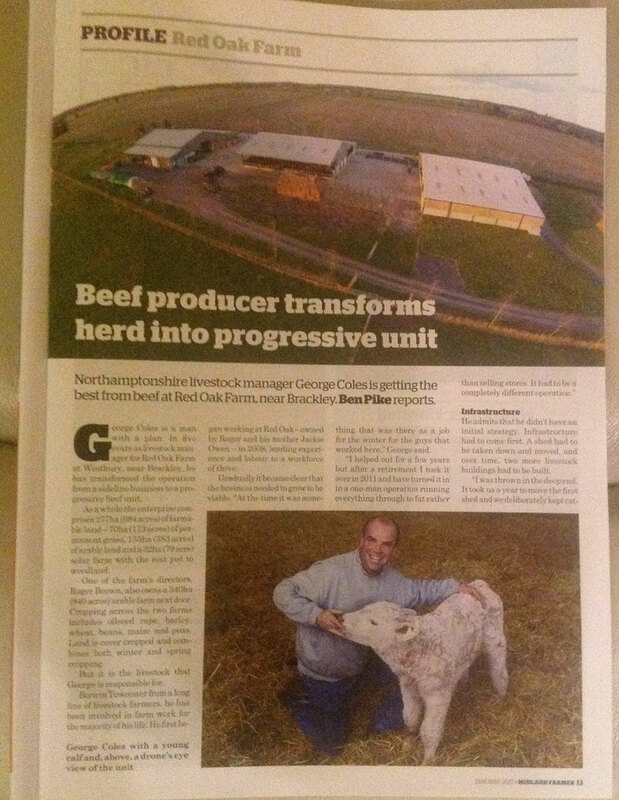 George is featured in the Midland Farmer magazine. Article in the Buckingham Advertiser. Article in the Northampton Chronicle & Echo. A farmer from Northamptonshire has made it onto the shortlist of this year’s prestigious M&S ‘Farming for the Future’ awards. The commercial herd at Red Oak Farm is a mixture of Hereford, Simmental and Aberdeen Angus-cross cattle and numbers around 120 breeding animals. 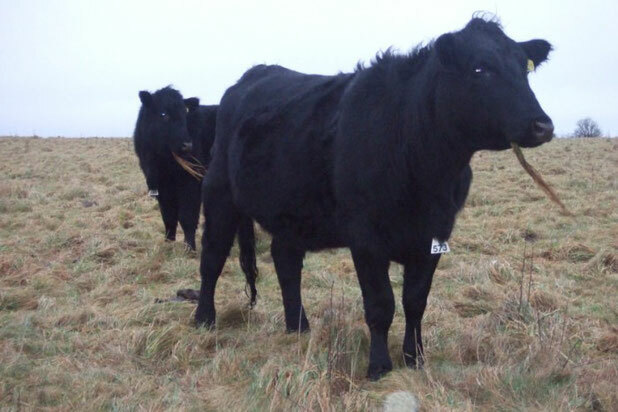 George is currently working to expand the herd to 200 breeding cattle and also develop a pedigree Red Aberdeen Angus herd. Under George’s direction, the farm has also undergone considerable investment, with a new buildings complex and handling systems put in place to allow room for future expansion. In order to maintain the high health and welfare of his cattle, George has readily embraced new technologies and ideas at Red Oak Farm and has recently purchased a thermal imaging camera to help him locate problems with his cow’s feet and hips, allowing for more rapid identification of problem cows, targeted treatment and reduction in the use of antibiotics. 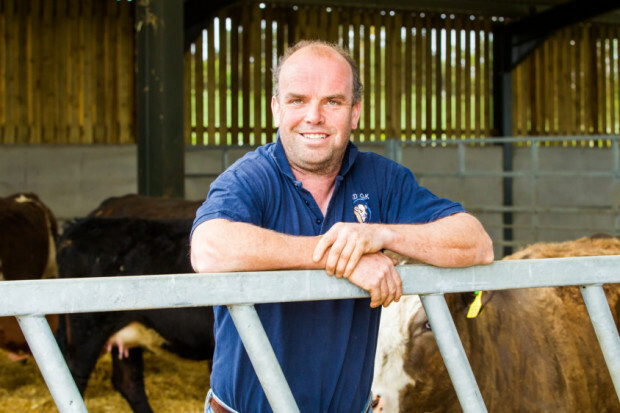 Alongside the work he does at the farm, George is also incredibly keen to improve his own approach to cattle rearing, therefore is an active member of three beef discussion groups. Red Oak Farm has also hosted a number of events for AHDB Beef and Lamb. The judges were extremely impressed with George’s vision and hard work in establishing a new Red Aberdeen Angus herd, alongside his commitment to improving his own knowledge and understanding of beef production. 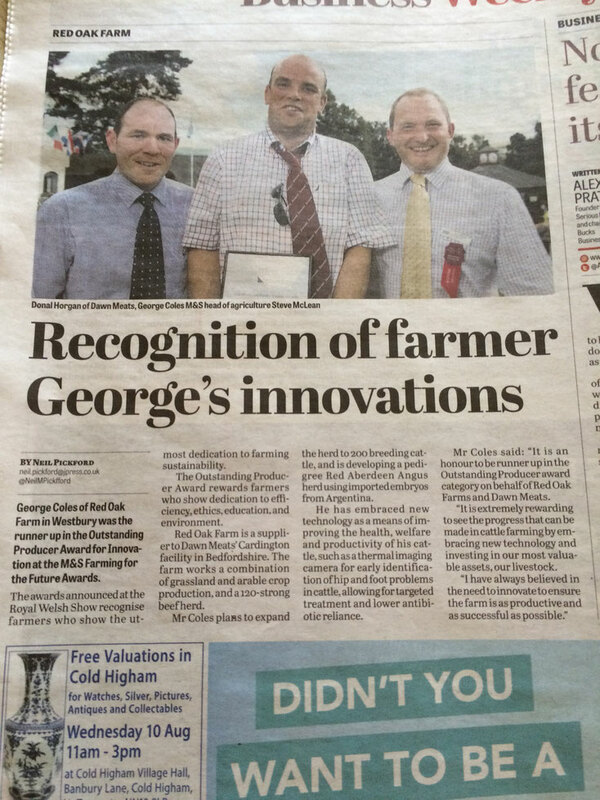 George has also embraced new technology to improve herd health and welfare. M&S Farming for the Future is a programme of initiatives which champions sustainability and innovation. The programme is designed to help farmers identify opportunities for improvement, increase their profitability and provide a sustainable supply chain that can continue to deliver quality and innovation for the long term. Steve Mclean, M&S head of agriculture and fisheries, said: “We are continually impressed with the commitment and passion our suppliers show towards sustainable farming practices and with such strong talent emerging within the industry, the judging process for our Farming for the Future Awards becomes more challenging every year. This article can also be seen on the Chronicle & Echo website. A Westbury farmer has made it on to the shortlist of this year’s prestigious M&S Farming for the Future awards. George Coles, from Red Oak Farm, will find out if he has been crowned winner on the first day of the Royal Welsh Show in Builth Wells, Powys on July 18. 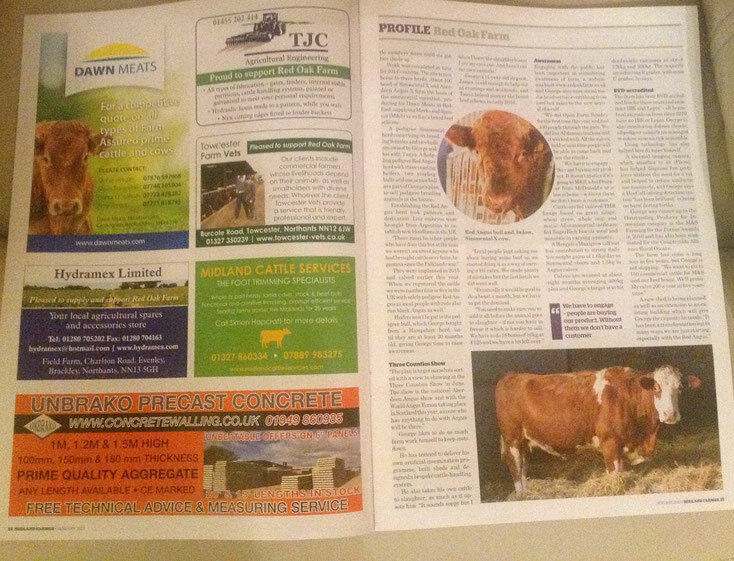 This allows for faster identification of problem cows, targeted treatment and reduction in the use of antibiotics. George is also keen to improve his own approach to cattle rearing, and is an active member of three beef discussion groups. M&S Farming for the Future champions sustainability and innovation. This article is also on the Buckingham Today Website. 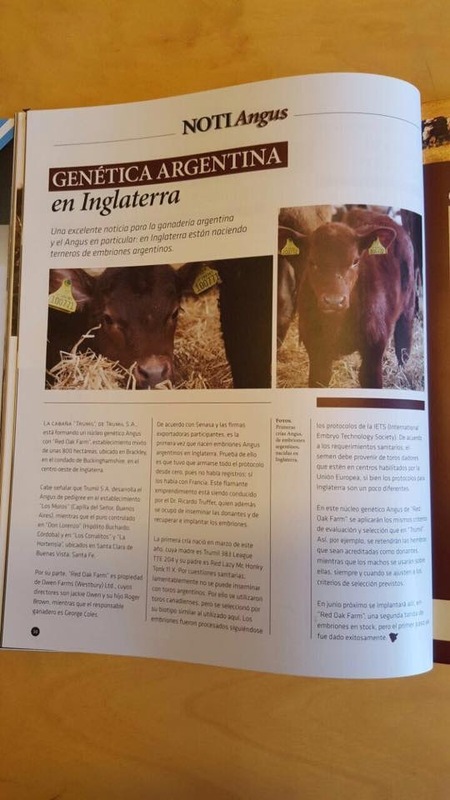 Article published about the pedigree Red Aberdeen Angus embryo program in Argentina. We will add a better copy when we have one and also a translated copy. George was interviewed by BBC Radio Northampton in the build up to Open Farm Sunday. 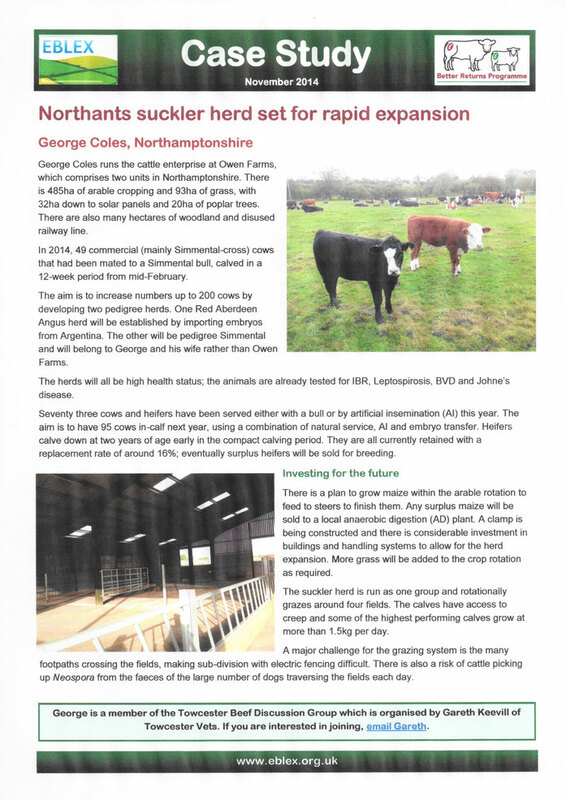 Eblex use George as a case study for their grassland news publication. 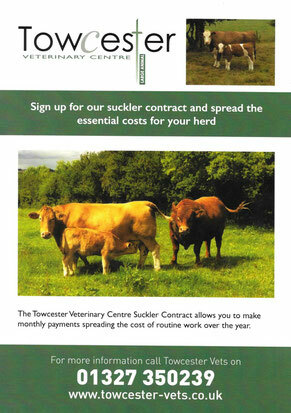 One of George's photos is being used to help promote Towcester Veterinary Centre's beef suckler contract (see small photo in top right hand corner of Ermentrude with her calf Florance taken in 2014).